Cary Weighs In: Many of you have commented lately on how much little Cary has grown. On May 18th I reported that she weighed about 9 pounds. This morning she tipped the scales at 29 pounds. No more scooping her up and carrying her around tucked under one arm. And while she does still like to curl up by my feet while I am sitting at the computer, there isn't much room down there for my feet anymore. Right now Cary is standing at the closed office door, alternately staring at me and nibbling on a plastic bucket. She is wondering why we aren't out in the garden eating real food. Gotta go. Hi Susan! I am an animal lover!If I had the money Id also buy a huge farm!My husband is always saying If I bring one more animal home he is going to divorce me. But that was about 8 Lovebirds, 4 dogs, 4 cats and a hamster ago.LOL! I love your pics of all your animals.Especially Cary! She is adorable! Keep the recipes coming too! I gotta try the Blueberry breakfast bars!Thanks! Cary is beautiful. Have fun in the garden! Have you visualized Cary as a 150 lb. sheep? Will she still be wrapping herself around your feet? I wonder what will become of her as she grows larger. It would be hilarious, though, if she still followed you everywhere you went, including inside your home, when she's full grown! Oh, Cary. 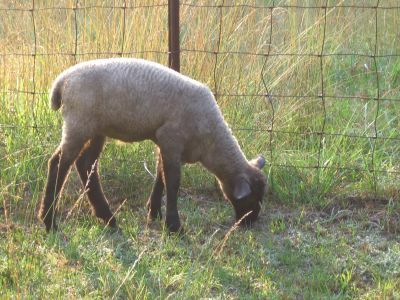 I recall an orphan lamb that turned into a ram - Kevin. Kevin thought he was a person/sheep. He became too possessive over people and encroached on human territory just a wee bit too much. I probably still have the bruises from him using me as a stopping post in his run over to see me. He ate washing off the line, thought the house was his and got pretty grumpy when you prevented him access. Eventually, he had to be sent to another farm as he was becoming a hazard to people visiting - and me! So it will be interesting to see how Cary grows into the role of adult sheep. For those wondering what will happen when she is full grown...let's not forget our Farmgirl is not new to the sheep raising business...she most certainly knows that tiny little Cary will grow big but if you read the "Tiny" story of how it all began, you'll see what Farmgirl promised. "She picked up the abandoned little lamb (whom by this time she had named Caraway), held her up in front of her, looked straight into her beautiful blue-gray eyes and said, "Okay, here's the deal, Cary. From this minute on, I am going to be your mother. Now I can't guarantee that we will all live happily ever after. And I'm not sure if your injured leg will ever work properly. But what I can promise you is that I will always love you with all of my heart. We'll just take it one day at a time, and do the best we can." and she will...and Cary will, too. Her leg is working wonderfully well and the rest of her life with Farmgirl will no doubt be pretty wonderful, too, whether she is in the house or with the rest of the flock. Cary was extra double lucky that she was born on Farmgirl's farm, and we have been fortunate that Farmgirl shared the experience with us.